As the Mega Nova fishing boat carries me and a dozen other hopeful whale-watchers into the Bay of Fundy, our chance of seeing whales feels slim. Brier Island, where we boarded, has been snarled in fog since the evening before. The narrow stretch of water left visible by the low-hanging sky looks grey and impenetrable, the crosswinds skimming over it creating hatchet lines. If I were a whale I’d choose a day like today for moping about in the murky fathoms, rather than performing for a boatload of tourists. Not that performing comes into it. My hosts at Brier Island Whale and Seabird Cruises Ltd conduct marine research in the bay, recording the behaviour of sealife and making their findings available worldwide. We are there to observe, not harass, and any close encounters will be at the discretion of the whales. Even the Mega Nova is named in their honour: megaptera novaeangliae is the scientific term for a humpback whale, meaning ‘big-winged New Englander’. I’m already in love with Nova Scotia; its foggy mornings, torn coastlines pinned by lighthouses, and cultural diversity shaped by the native Mi’kmaq people and settlers from France, Ireland, Scotland, Germany and New England. I’ve had a wonder-filled trip so far: digging for clams, learning about shipwrecks and exploring the UNESCO town of Lunenburg. So although my enjoyment of the week doesn’t depend on seeing a whale, it would complete the experience. Sometimes they swim under the boat, I have heard. Sometimes they get so close you can smell their fishy breath. Harold Graham, the owner of the company and our cruise captain, is optimistic. “We always see whales – we’ll find some,” he tells me from the helm of the Mega Nova. He would know: Harold has been running whale-watching tours for 27 years, navigating the Fundy waters for many more. In the winter, when the whales migrate to the warmer shores of the Dominican Republic, Harold is a lobster fisherman. I think I can guess which role he prefers. Showing me computers tracking the depth of the seabed and our position in the bay, Harold says he is looking in particular for a humpback whale named Shuttle, so called because of the rocket-shaped markings on the underside of her tail. A finalist in the New7Wonders of Nature, the Bay of Fundy between Nova Scotia and New Brunswick has the highest tides in the world. One hundred billion tonnes of seawater flow in and out twice each day, bringing nutrients to the surface and encouraging the productivity of plankton and, in turn, mackerel and herring. This makes the bay an attractive summer playground for whales, dolphins and porpoises to feed and breed – and an ideal place for us to spot them. The marine life extends up and out of the ocean too, to migratory birds flitting at the water for its plentiful supply of fish. “Anyone interested in birds?” asks Shelley Barnaby, the chief naturalist on board. Two boys turn up their noses: “Oh my god, no!” says the elder. Their mother looks indulgently on, telling Shelley the youngest had been studying whales at school. He nods in agreement: “I know everything about them now”. But I’m interested in the birds. During the cruise we’ll sight puffins, greater shearwaters darting at the surface for food, and gull-like northern fulmars which Shelley says throw up when frightened. At this the boys show a little more enthusiasm, baring their teeth out to sea and growling. As the Mega Nova powers further out of the bay, the fog lifts, the sun emerges from its grey pall and people start tying their coats and jumpers around their waists. The calmer waters are black-blue now, instead of their earlier charcoal. Having heard via a radio to another cruise boat that there are whales in the vicinity, Harold drops the engine so we can drift quietly for a while, the atmosphere tense as we listen for the slapping of flukes or the booming of a lobtailing humpback. Suddenly: “On the right side,” says Shelley, grabbing her camera, and we scramble in the direction of her pointing finger. The younger boy bowls over to the edge of the boat, knocking people out of his path. The other boat is bobbing on the water about 30 metres away, and I hear the delighted cries from its passengers before I see them myself: three humpback whales gently surfacing in near synchronicity. It is hard to believe their enormous sleek dark bodies are real; their dorsal fins jutting out of the water like animatronics from a monster movie. Several of our passengers shunt up the metal ladder to the top deck for a better view. I’m not surprised to see that the youngest boy is one of them; nor should I be surprised to hear a breathy blow from a whistle above. “Please don’t do that – the captain will think you’re in trouble,” calls one of the crew members kindly. The other boy, below deck, having upended himself into a coolbox of food supplied by his parents, is leaning over the side of the boat, cramming a sandwich into his mouth. “Those three whales were Flash, Tusk and Urik,” Shelley says, having photographed and reviewed their tail markings. “They were logging, which means sleeping”. Seeing the humpbacks has made my day, but there are more cetaceans to meet, more gasps of joy to be elicited from the Mega Nova. During the three-hour cruise we also encounter porpoises and, briefly, fin whales, nicknamed ‘greyhounds of the sea’ because of their speed and streamlined shape. We spy a humpback whale called Churchill (who got his name from the V-shaped notch in his tail) and Vibes, accompanied by her calf. By far our most spectacular sighting is of Lewkos, though, a humpback whale who swims close to the boat near the ocean’s surface and gracefully flips up her flukes as she dives, droplets of saltwater cascading from her body as she honours us with a perfect view of the underside of her tail. One of the biologists tells me later that humpbacks’ tails are graded by intensity from white to black and Lewkos’s bright flukes had inspired her name (lewko means ‘white’ in Greek). The elder brother, recovering from a bout of seasickness – perhaps intensified by his sandwich cramming – stands next to me and leans casually on the rail. He is pale and I feel sympathetic. Although the waters are calmer than earlier, the irregular loppiness of the boat is making me feel queasy too and I’m hanging on to my breakfast thanks to salted crackers pocketed the night before at the Brier Island Lodge. I could watch whales all day, but my sea legs are ready for land. I am disappointed not to have seen Shuttle. I have to remind myself that the Bay of Fundy is a natural wonder, not a theme park, and whales come and go in their own sweet time. But a few weeks later, as Brier Island Whale and Seabird Cruises enters its 25th-anniversary year, an update appears on Facebook. The bay had been “flat calm” one day, it seemed, and not only had the crew added two new mother-and-calf pairs to its list of whales, but Shuttle had been spotted in amongst the waves. I hope Harold is at the helm of the Mega Nova today, and even happier than ever in his work. Take a look at www.novascotia.com, uk.canada.travel and www.brierislandwhalewatch.com. 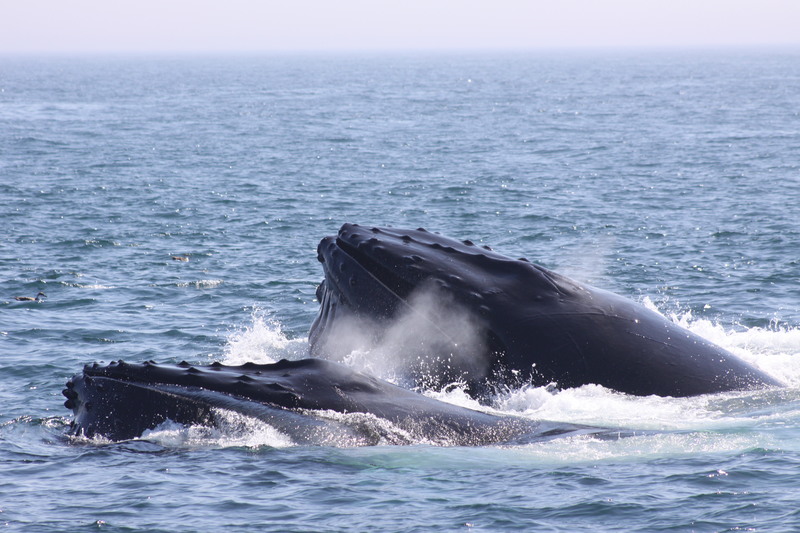 Image courtesy of Brier Island Whale and Seabird Cruises.